A revival of gem cutting occurred early in the 4th century during the reign of Constantine the Great and his sons. A number of very fine gems survive, including some exceptionally large examples cut in rarer materials such as amethyst and sapphire. Most of these stones are engraved with portraits of the emperor, and no Christian narrative scenes are known. 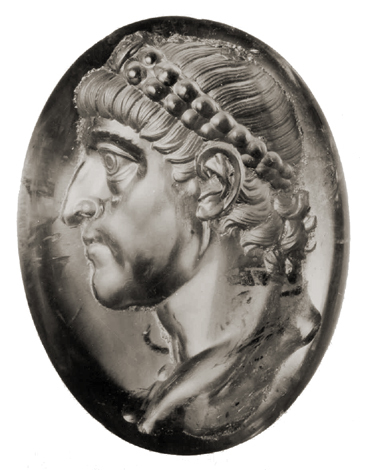 Portrait of Constantius II(? ), AD 337-361. Berlin, inv. misc. 30931. Amethyst, 37 x 28 mm. 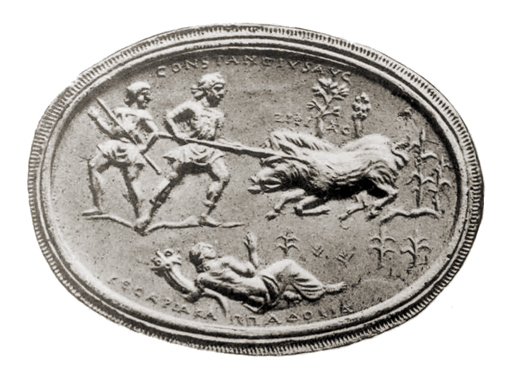 Constantius II hunts a boar in Caesarea, Cappadocia. Once Milan, Trivulzio collection. Sapphire.